Cuban revolutionary Fidel Castro’s ashes were encased in a large granite boulder on Sunday in a ceremony that capped nine days of public mourning and aimed to literally set in stone the legacy of one of the 20th century’s most influential characters. 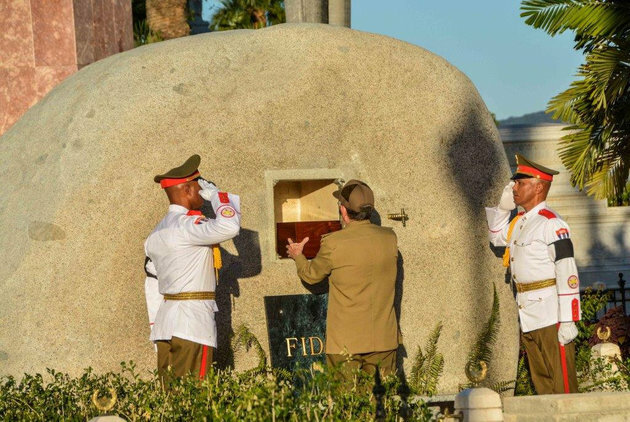 Cutting a solitary figure in his four-star general’s uniform, Cuban President Raul Castro placed a cedar box containing his brother’s cremated remains in a niche in the rock at the Santa Ifigenia Cemetery in southeastern Cuba. A dark plaque engraved with the single name “Fidel” was then fixed over the niche. Raul Castro saluted the tomb, which was flanked by two honour guards in white uniform, and a 21-gun salute echoed out. Fidel Castro toppled a US-backed strongman in a 1959 revolution and went on to build a Communist state a short distance from the Florida coast, surviving the collapse of the Soviet Union and relentless US efforts to force him out. His monument at the cemetery in the city of Santiago de Cuba sits a few steps from the mausoleum of independence hero Jose Marti, another towering figure of Cuban history. Castro’s naturalistic memorial is dwarfed by Marti’s mausoleum and other elaborate edifices at the cemetery. The stone is a few steps from a monument to rebels who died in an attack on the Moncada military barracks in Santiago at the start of the revolution. By contrast, the ceremony on Sunday was a private event accompanied by a military band and a small honour guard. It was only broadcast on state media 13 hours later. A small group of guests attended including Castro’s children and wife Dalia Soto del Valle, who appeared overcome with emotion, and Argentine soccer legend Diego Maradona, who was a friend of the Cuban leader. A clutch of left-wing allies was also present, each laying a white flower at the stone. Among them was Nicaraguan President Daniel Ortega, who like Castro came to power in a guerrilla war and faced off with the United States during the Cold War. Later, members of the public were allowed to lay flowers at the memorial in small groups of ten. “I wanted to give him one last goodbye, although he will always be present in my heart,” said Angela Rodriguez, 62, one of the first people allowed to view the boulder. Castro gave Cuba an outsized influence in world affairs, aligning Cuba with the Soviet Union. He relished tormenting Washington during half a century in power, crossing swords with 10 US presidents and playing a central role in the Cuban Missile Crisis of 1962 that took the world to the brink of nuclear war. Castro’s rule came with its own wardrobe and props: olive green fatigues and military hat, boots and a beard, and until he quit smoking in the 1980s, a long lancero cigar. He was despised by Cuban exiles who fled his government in the hundreds of thousands as he confiscated private property, jailed opponents and shut down almost all dissent. But he was also feted by South African leader Nelson Mandela for helping to end apartheid at a time when the US government and other Western powers supported the racist system. An intestinal ailment forced him to cede power to Raul, now 85, at first provisionally in 2006, then definitively in 2008. In his final years, he wrote columns on the world and local matters and received foreign dignitaries at his home on the outskirts of Havana. He governed for 49 years but angrily rejected suggestions he was a dictator and denied any personal enrichment or personality cult around him. In keeping with his wishes, Castro’s image will not be immortalised with statues and public places will not be named after him, his brother said on Saturday. Throughout his rule, Castro sent doctors and soldiers overseas to burnish Cuba’s international reputation. In recent years, Cuban doctors have been praised for quick deployment in international health crises, including the 2014 Ebola outbreak in West Africa and the aftermath of Haiti’s 2010 earthquake. The impact of his long clash with the United States is still being felt. Cuban-Americans in Miami celebrated his death, and Washington maintains a trade embargo that Castro long decried as the reason for Cuba’s economic troubles. President Barack Obama changed course on US policy toward Cuba in December 2014, agreeing with Raul Castro to exchange prisoners, restore diplomatic ties and boost commercial links between the two countries. Fidel Castro gave only grudging approval to the detente brokered by his brother. He did not meet Obama during his historic visit to the island, instead penning a column that warned Cubans not to trust the president’s “honey-coated” words. this is good informations…and good news..i thank you this post. i thank you this post.